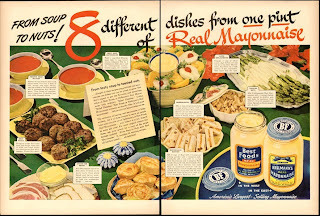 Since the last couple of days we have been building on a theme of mayonnaise (well its in the quiche at least), lets complete that with this 1948 ad. I grabbed it because of brand recognition mostly, I'm familiar with Hellman's Mayonnaise, and also because it seemed to have recipes on it. Mock Hollandaise which seems to be a mix of mayo and vinegar. I scoff at your holladaise, hell I mock it even because you're not fooling anyone... it's just vinegar and mayo you skinflint. Or how about Toasted Nuts coated with, you guessed it, Mayonnaise. That sounds like snack food at a swingers convention. From tomato soup deluxe (deluxe because it has mayo in it) to mayonnaise muffins, my favorite has to be fruit juice mayonnaise that is used as a dip for canned whole fruit displayed in a deep mixing bowl with tons of leafy greens. Sounds absolutely enchanting, n'est pas? Marketing hasn't changed over the years, the marketers are always assailing us with new ways to use their products, we only wish their suggestions would be tasty once in awhile. I may like experimenting with vintage recipes, but some stuff is best left alone or better yet locked in the deep, forgotten vaults of time.